You can find many articles through the library! The majority of current articles are available online. You can find these through the Library's website or one of the many databases we subscribe to. Remember: no single database contains all articles. Sometimes it is best to search a more specific journal database than MavScholar. When you search a database, you'll get information from lots of journals at once, saving you time and energy. Most databases are subject-specific, so you know you'll get relevant information. You can access databases from Memorial Library's homepage. On the left-hand side, you'll find our links to databases. Our "Article Databases A-Z" is great if you're trying to find a specific database. Or else, check out our "Class and Subject Guides." They're divided by department and class, and through them you can usually find databases topically. If you know the name of the database you're looking for, click Article Databases A-Z and find it easily. Databases all look a little different, but they work in similar ways. Check out the visuals and directions below to get an idea for how they work. Getting too many irrelevant sources? If you're getting too many irrelevant results, you can narrow your results using the sidebar. Narrow your results by date, source type, and other limitations. There are a few options that will probably be more help than others. 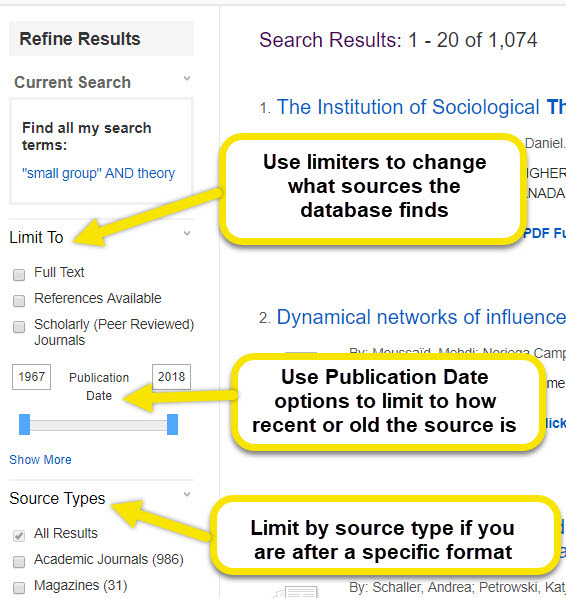 For instance, in the Academic Search Premier database, you can limit the search to "Full Text" or "Scholarly ( Peer Reviewed) Journals." Full text means that the database will only look for the articles where the database has the whole article. "Scholarly (Peer Reviewed) Journals," means that the articles found will only be from journals that are reviewed by expert scholars. Sometimes, however, NOT limiting to Full Text can turn up better search results. By including non-full text results, your search will include articles from other databases available at the Library (and at other libraries from which the University can borrow). As you continue with your research, you may want to change your keywords by using different words and phrases you find. Be on alert for synonyms and abbreviations for the keywords you choose. 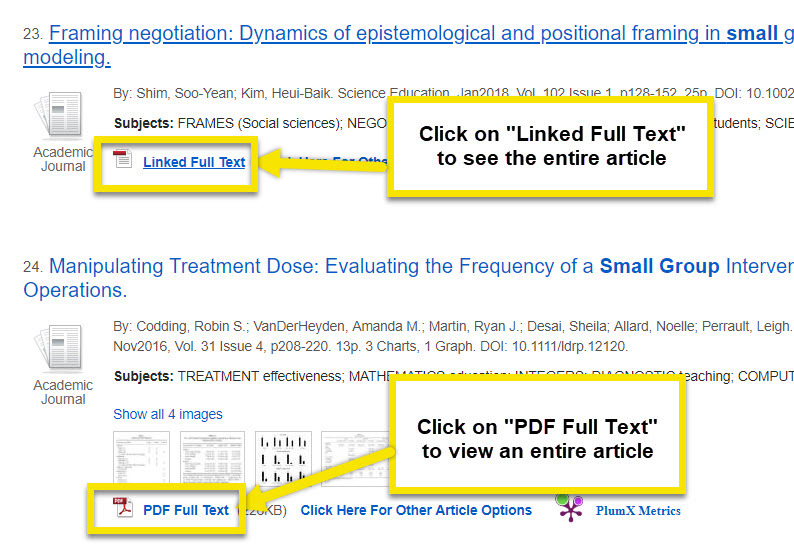 To access these full texts in a database, look for links or buttons that say things like "Linked Full Text," or "PDF Full Text." These links will bring you right to the entire article. A purple Library Services bar will BRIEFLY appear. Our behind-the-scenes service is searching for access in another one of our databases. A different website will have HTML or PDF access to the article. Sometimes, instead of linking to another database, the page will go to MavScholar's Get It section and show the location of MSU,M Memorial Library. This means the library subscribes to a paper copy of the journal. Journals are located in the Periodicals section of the library on the first floor. 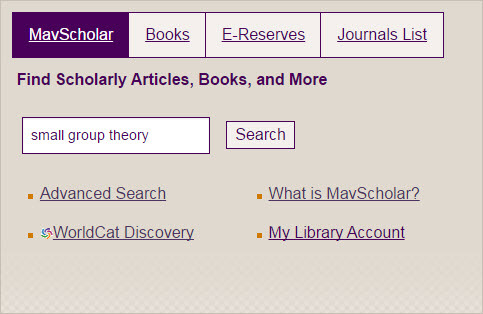 If the screen opens to MavScholar's How to get it section with only a Sign in option, Minnesota State, Mankato does not have immediate access to this publication. In this case, you can order the article from another library by clicking Sign in to submit an Interlibrary Loan Request. For more information about this process, check out our guide on requesting articles from other libraries. If you have any trouble, please talk to a librarian.